Would you believe me if I told you about some divers with more "daring do" than perhaps even Jim Bowden's best? How about diving technology so advanced that Dr. Bill Stone and Oliver Islar's developments are relegated to mere honorable mention status. Is this possible? Remarkably, not all epic explorations are measured in distance or depth. The dives that I am about to relate to you did not exceed 1,000 feet in length, nor did they go deeper than 40 feet, yet their historical significance is unsurpassed. Imagine using diving equipment so different from known technology that it is truly radical. 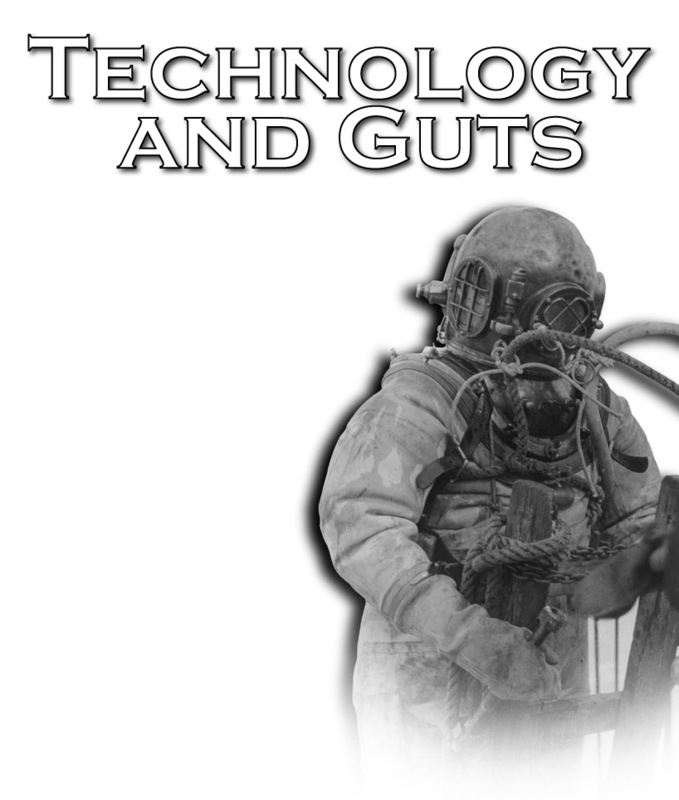 Yet technology was only a part of the picture; the other, perhaps more important aspect was "guts". The divers involved exhibited almost unbelievable courage in an escapade that would humble even the best cave divers today. On November 3, 1880, a 29-year-old inventor, Henry A. Fluess, arrived in Portskewett from London. He brought with him the world's first, practical, self-contained breathing apparatus. This life support unit was actually a very simple rebreather, but nothing like it had ever been seen before. Up until then, divers could only use cumbersome surface supplied dive gear. Portskewett is the site of the Severn tunnel. During its construction, the tunnel had suddenly flooded. The engineers needed to get a person 200 feet down a shaft which had 40 feet of water in it, then 1,000 feet back into the flooded tunnel. The mission was to close a four-foot by four-foot iron door so that the tunnel could be pumped out. The conventional hardhat dive gear of the day proved unworkable because of the 1,200 feet of umbilical that had to be dragged in. Imagine a 1,200-foot push into Ginnie Springs in full heavy gear, pulling an air hose. The tunnel engineers were snookered. They had hit the wall of known technology. Fluess himself had made a couple of dives to test his new apparatus, but he had never actually done a working dive. None the less, he had come to offer the services of his new device. After studying the drawings of the shaft and tunnel, Fluess had Alexander Lambert, an employee of Siebe Gorman & Co., and a very experienced diver, stand by at the bottom of the shaft. The idea was for Fluess, who was wearing his oxygen rebreather, to be lowered down the 200 foot shaft, where Lambert would undo Fluess's lowering rope, then point him in the direction of the flooded tunnel. Keep in mind that underwater lights, communications, bail out gas, and OSHA inspectors were a thing of the future. So imagine Fluess, essentially a non-diver, using the first experimental O2 rebreather, crawling along in absolute darkness, between the train rails, reaching through the mud to feel his way, pushing through restrictions and construction debris--all without a lifeline. Was he wondering what was going to give out first? Perhaps it would be the oxygen supply in the 450 psi copper cylinder or the carbon dioxide absorbent (hemp fibre impregnated with a solution of caustic potash) or maybe even his nerve? His first effort lasted one hour and netted him about 300 feet. Today this would be considered more than twice the allowed NOAA oxygen exposure at his PO2, which in itself was dangerously high. Again and again he tried, each time gaining a bit more distance. It eventually became clear that the equipment would work, but Fluess's inexperience as a diver was letting him down. Alexander Lambert, who would eventually become famous for his diving exploits around the world, asked if he could give it a try. That afternoon, Lambert became the first working diver to get trained on a self-contained breathing apparatus. Lambert's attempts the following morning resulted in a successful, 1,000-foot penetration into the tunnel, where he managed to take up one rail and partially remove the other from the sill of the door. This effort took one hour and 30 minutes. Taking a smaller crowbar in on his next attempt, he removed the final obstruction and closed the iron door. Lambert's exposure to oxygen partial pressure was more than three times that which was allowed on the NOAA exceptional exposure limits table. In addition, his PO2's were as high as 2.0 ata's, depending on how efficiently he purged the breathing loop (whether by accident or design). Consider that this diver was working hard, in total darkness and under primitive conditions, while utilizing totally unfamiliar diving equipment. In the event of hypercapnia, oxygen toxicity, hypoxia, disorientation, or caustic cocktail, these pioneers were on their own. Without any of the redundancy, protocols or training that today's divers take for granted, even the slightest problem could have resulted in a fatal incident. This epic adventure by Fluess and Lambert in the Severn Tunnel more than 120 years ago, puts into perspective our diving achievements today. Many things have changed since the time of Henry Fluess and Alexander Lambert, but the success formula remains the same: technology and guts.